Cassia grandis and Bixa orellana are important plant species with folk use and great potential for phytopharmaceuticals. Nanodispersions are disperse systems of insoluble or immiscible substances in a liquid medium that may be prepared with or without coating polymers. To our knowledge, no studies were carried in order to achieve coating-polymer free nanoformulations using B. orellana extract or any C. grandis-based nanoformulations. Thus, on the present study we aimed to develop C. grandis nanoformulations using three different coating polymers (Eudragit® L 100 55, PEG 4000 and Kollicoat®), while B. orellana nanodispersions were obtained using different surfactants (polysorbate 80, polysorbate 20, polyethylene glycol 400 monooleate, polyethylene glycol 600 monooleate, polyethylene glycol 400 dioleate and polyethylene glycol 600 dioleate) as coating polymer-free nanoformulations. Characterization of nanoformulations was performed by different parameters, including particle size, polydispersity index and zeta-potential. 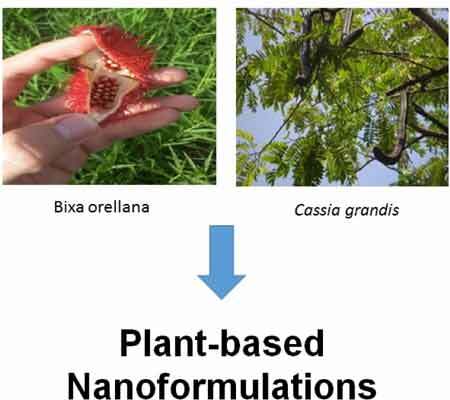 Our results suggested that some optimal nanoformulations were obtained for both plant species. Moreover, possible stable behavior was observed during storage period for C. grandis (30 days) and B. orellana (21 days). On this context, the present study contributes to nanobiotechnology development of phytopharmaceuticals, allowing achievement of novel nano-delivery systems with two important folk medicinal plant extracts and making them potential products for innovative phytopharmaceuticals. Bixa orellana, Cassia grandis, Nanodispersions, Non-ionic surfactants, Particle size, Polydispersity index, Zetapotential. Laboratório de Nanobiotecnologia Fitofarmacêutica - Colegiado de Ciências Farmacêuticas, Universidade Federal do Amapá, Rodovia Juscelino Kubitschek, KM, 02-Jardim Marco Zero, CEP: 68903-419, Macapá, AP, Brazil and Laboratório de Pesquisa em Fármacos, Colegiado de Ciências Farmacêuticas, Universidade Federal do Amapá, Rodovia Juscelino Kubitschek, KM, 02, Jardim Marco Zero, CEP: 68903-419, Macapá, AP, Brazil.